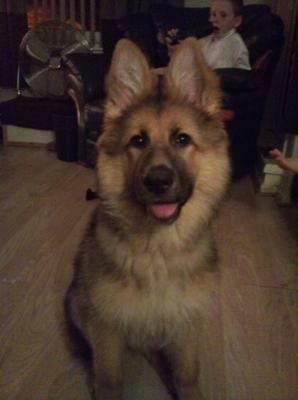 My 14 weeks GSD is very afraid when she is with others dogs, barking a lot, then when those dogs come closer, she runs back but still barking. This happen almost all the time while walking on the park. I don't know what to do, could you help me? With people she is pretty sociable but not with others dogs. Total German Shepherd:Your GSD puppy needs socialization - that's why she's so scared of other dogs. She hasn't been properly socialized with other dogs and needs to be introduced to other dogs and puppies (and lots of other animals and situations as well) to become a calm and happy adult GSD. If there is a dog training class for puppies in your area, that is a great place for this type of training to start because your pup will be around other puppies to get used to them plus you'll learn basic obedience as well. A great, great thing to do with any young dog. If that isn't a possibility, perhaps you have a dog park or a doggie day care type situation close by where she can safely meet other dogs in a secure location. I would ask you vet for suggestions on this. Plus, take her everywhere you can - on car rides, to dog friendly businesses, to your vet (just for friendly visits), etc so that your dog can observe other dogs. The more she does this the more calm she'll be - eventually. Just don't try to force her into any situation she's not comfortable in because it'll just make things worse. If you have friends who are dog people and they have calm dogs, invite them over for visits. As long as your dog is calm let her observe the happenings - if she withdraws let her. Sometimes if you "ignore" them (but while still really watching your dog carefully) as you interact with the other dogs in your home (if they are over visiting) the shy dog will want to interact too and with practice their confidence will grow and they'll want to interact with the other dogs. But keep in mind that it's not a fast fix so be patient with your puppy. Good luck.